It’s that time of year again. Families and friends are getting together all over the country and preparing to celebrate joy and holiday cheer. Among the gifts, food, and drink, however, is the all-important consideration of safety during the holiday and winter season. The holidays can be some of the year’s greatest weeks, full of fun and memories, but it can also lead to fires and accidents. These basic steps can help you keep you, your family, and anyone who visits, safe to enjoy the festivities without any stress or injuries. Turn off all holiday lights when you are not home. These lights should be labelled with proof of inspection from a recognized testing laboratory. Make sure you know whether it’s designed for indoor or outdoor use. Replace strings of lights with worn or broken cords or loose bulb connections. Do not overload your electrical outlets. Keep all candles, matches, and lighters out of the reach of children. According to the National Fire Protection Agency (NFPA), December is the peak month for home candle fires. Keeping candles too close to things that could catch fire are the reason for over half of all candle fires. Candles should be kept at least 12” away from anything flammable, and should be blown out before leaving the room or going to bed. Candle holders should be sturdy, resistant to tipping over, and placed on uncluttered surfaces. They should be kept out of the bedroom, where over one-third of home candle fires begin. Flameless candles can be a great alternative, since they look and smell like real candles. Be careful with Christmas trees. The NFPA states that the U.S. fire departments annually respond to an average of 230 home structure fires due to Christmas trees. Of out of every three fires are typically caused by electrical problems, and one in six are because of a heat source that’s too close to the tree. Artificial trees should be labeled, certified, or identified as fire-retardant. Fresh trees should have green needles that stay on, and should be watered daily. Make sure that trees do not block any exits and are at least three feet away from any heat source like fireplaces, radiators, candles, space heaters, and heat vents or lights. Never use lit candles to decorate the tree. Most importantly, get rid of the tree after Christmas. Dried-out trees are a fire hazard and should be removed from the home and placed outdoors. The holidays are only the beginning of the winter season. After the gifts are unwrapped and food is eaten, we have to prepare for the rest of the winter. Here are some tips to keep you safe during the winter months. 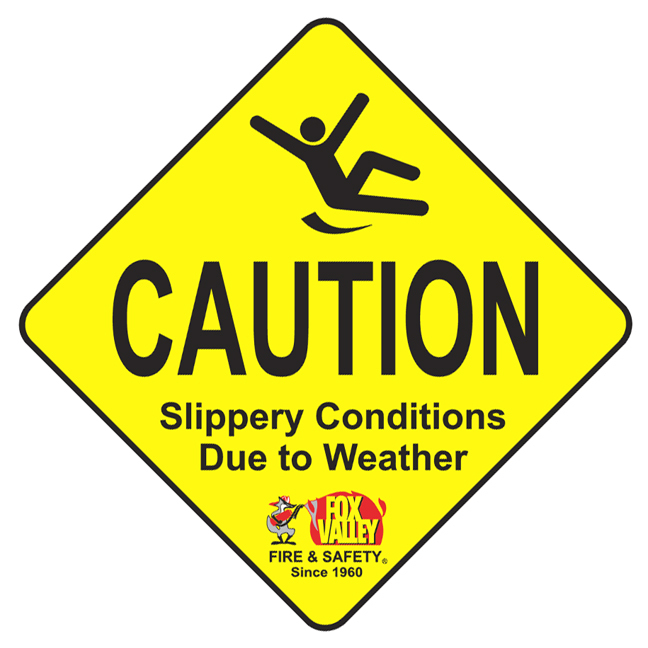 Walking around during winter can be hazardous when you’re working with equipment. Same-level falls, for example, the cause of about 61% of lost-time injuries. 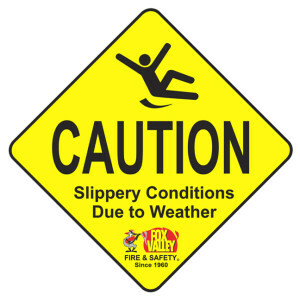 Prevent slips by taking shorter steps on slippery surfaces to ensure that the center of balance is under you. Take special care on smooth and waxed floors. Trips can be avoided by simply paying attention. Watch where you’re walking and avoid looking at your smartphone at the same time. Don’t carry any items that don’t let you see over or around. Keep walk areas clear of potential trip hazards, and watch for rolled up corners of carpets by doors. Prevent falls by refraining from jumping off landings, stairs or loading docks, and use handrails to ensure safety. Make sure your vehicle is in proper operating condition, including windshield wipers and tires working correctly. You should have enough windshield wiper fluid, and tires should be the right pressure. Try the brakes occasionally to constantly check the slipperiness of the road. Visibility should be high on your list of priorities while on winter roads. Clean all snow, ice, and frost off your windows, as well as from your head and tail lights. Always carry a bag of emergency supplies, just in case. This should include snacks, water, blankets, gloves, hats, snow boots, and even a warm coat. Make sure to have replacement cell phone chargers that work with your car battery. 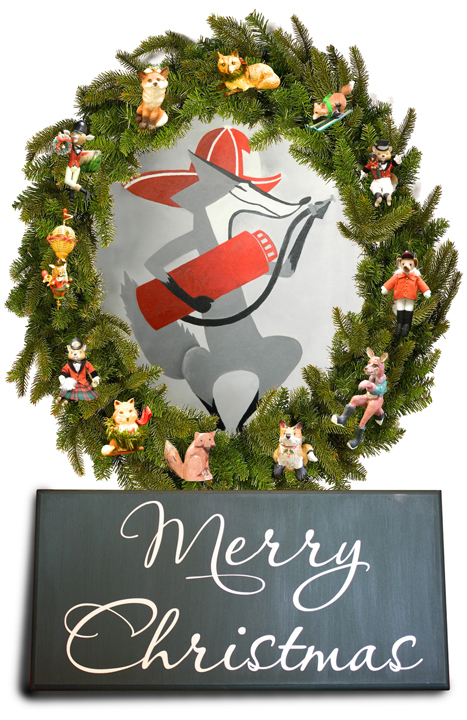 Visit Fox Valley Fire & Safety for a full list of what to have on hand to safely see you through the winter and holiday season!